Health insurance marketplaces, a pillar of the Affordable Care Act, open today, allowing millions of Americans to compare and apply for insurance plans through their state or the federal government. Information about how the exchanges work and how to apply is available online, by mail, or in person. Many of the organizations tasked with getting the word out to the public hope the health exchange web sites will drive access and enrollment. How effective will the internet be for this job? Results from a mid-2012 survey by the Pew Research Center’s Internet Project show that 21% of the uninsured are not internet users themselves. The poll showed that, overall, 18% of American adults are uninsured, a figure that is in line with other surveys done at the Pew Research Center and other organizations. While those who already have health insurance are urged to explore getting a new plan in the exchanges, most proponents say signing up the uninsured is a priority. Some of the groups most likely to not have health insurance are the same as those groups most likely to not be online. This includes Hispanics, those who have not attended college, and those living in lower-income households. Some of these groups are also less likely to seek health information online in general. 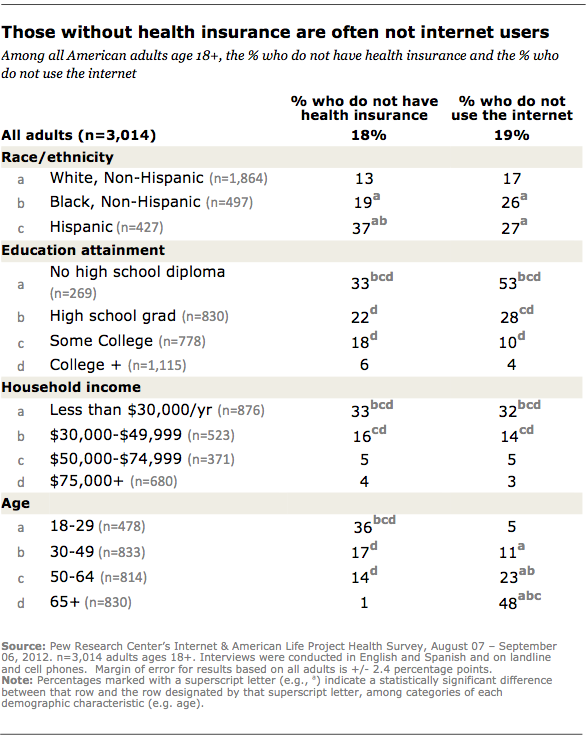 Among internet users, the 2012 survey showed that those who had not attended college were less likely than those with at least some college education to be online health-seekers. Likewise, those living in households with an annual income of less than $50,000 were less likely to look for health information online compared to their more affluent counterparts. Internet users without health insurance were significantly less likely than their insured counterparts to seek health information online (59% of uninsured vs. 75% of insured). The same survey also asked online adults whether they use the internet to look for information specifically about health insurance and a quarter of internet users said they did so. College graduates were more likely than those with less education to look online for information regarding health insurance. Otherwise, there were no major demographic differences. Health insurance was the most popular health search item after specific diseases (55% of internet users), treatments (43%), and weight loss tips (27%). The insured and uninsured were equally likely to look online for information regarding health insurance. One group that may benefit from online access to health exchanges is young people. 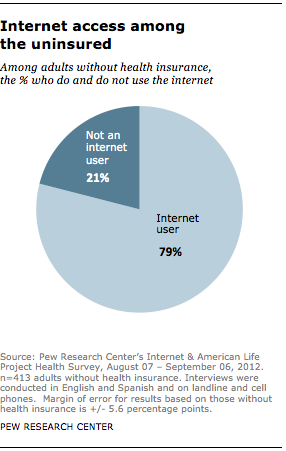 Almost all of those 18-29 are internet users (95%), but 36% do not have health insurance. Young adults ages 18-29 are also significantly more likely than those over 65 (the age group most likely to have insurance) to seek health information online. When it came to seeking information specifically about health insurance, online young adults were equally likely as older internet users to have sought that kind of information.